MGW-60002 is an original issue of EmArcy MG-36093. B-1 and B-4 previously issued on EmArcy 16008 (78rpm) and 16008x45 (45rpm). My copy is the earliest pressing with MF1/MF1 matrix stamps, while Mr. Hasegawa's copy is a bit later pressing with MF1/MF2 matrix. Yet another nice bop compilation featuring three different sessions. A-1 thru A-4 are by Art Mardigan Sextet featuring John Williams on piano. A refreshing bop session with unique sound colour. 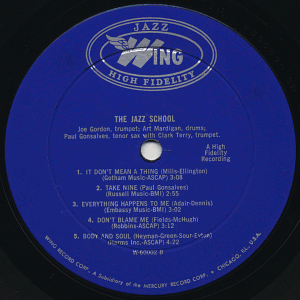 B-1 thru B-4 are by Paul Gonsalves Sextet featuring Clark Terry. A bit corny, but also a nice mainstream session. 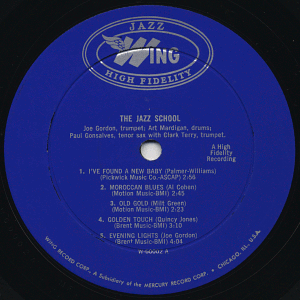 A-5 and B-5 are by Joe Gordon Quintet, and are outtakes from MG-26046 and MG-36025. 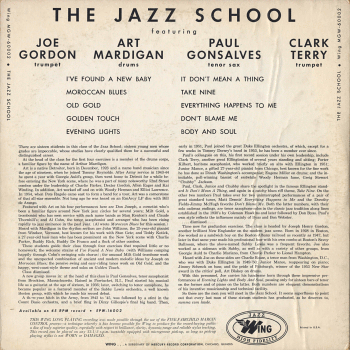 On these two tracks, Joe Gordon's brilliant trumpet blows so great, and Art Blakey's propulsive rhythm gives the entire mood of this great hard-bop session. John Williams (p), Teddy Kotick (b), Art Mardigan (ds). Recorded in New York City on May 20, 1954. Junior Mance (p), Chubby Jackson (b), Eugene Miller (ds). Recorded maybe in Chicago, IL on February 6, 1954. 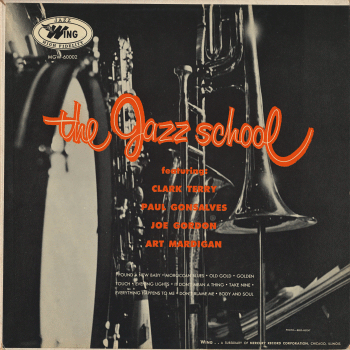 Joe Gordon (tp), Charlie Rouse (ts), Junior Mance (p), Jimmy Schenck (b), Art Blakey (ds). Recorded at Fine Sound Studio, New York City on September 3 (B-5) and 8 (A-5), 1954.
visitors to this page since July 02, 2004.